Dinajpur is one of the lovely city in northern part of Bangladesh. A lot of historical places, educational institutions, Medical college hospitals are there. A lot of people travel from Dhaka to Dinajpur every day and journey by train from Dhaka to Dinajpur is really fascinating. 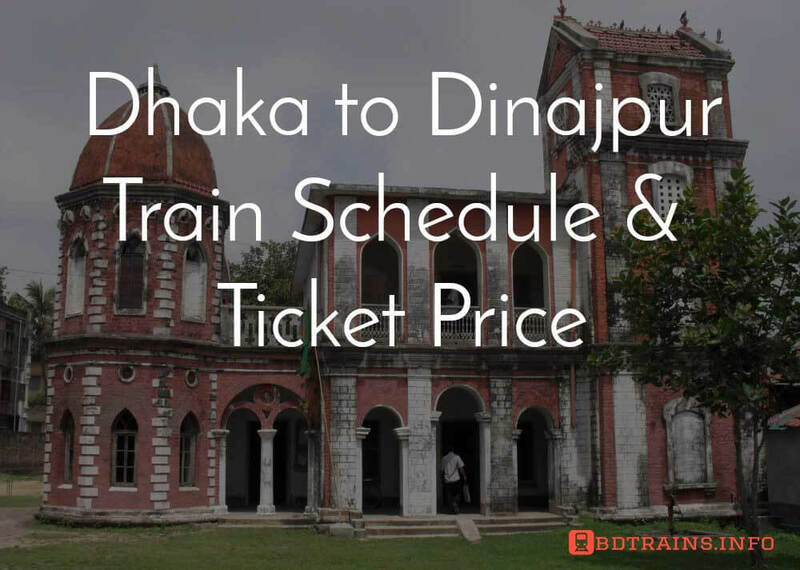 In this post, you will be able to know Dhaka to Dinajpur train schedule and Dinajpur to Dhaka train schedule. We will deliver a list of ticket price from Dhaka to Dinajpur too. Hope you will be benefitted with this post. There are two trains from Dhaka to Dinajpur and Dinajpur to Dhaka. They are Ekota Express and Deutajan Express. Both of train is huge and hope you will be travel very comfortably. Check out the schedule. Dhaka to Dinajpur Shovon Ticket Price 360 BDT. Dhaka to Dinajpur Shovon Chair Ticket Price 430 BDT. Dhaka to Dinajpur First Seat Ticket Price 570 BDT. Dhaka to Dinajpur 1st Birth Ticket Price 855 BDT. Dhaka to Dinajpur Snigdha Ticket Price 822 BDT. Dhaka to Dinajpur AC Seat Ticket Price 983 BDT. Dhaka to Dinajpur AC Birth Ticket Price 1478 BDT. Ekota Express leaves Dhaka at 10 AM and reaches to Dinajpur at 07:40 PM, Ekota express off on Tuesday. On the other hand, Ekota Express leaves Dinajpur 11 PM towards Dhaka and reach to Dhaka at 08:10 AM. Drutojan Express starts it's journey from Dhaka towards Dinajpur at 7:40 PM and reach Dinajpur at 5:30 AM. From Dhaka to Dinajpur Drutojan express is off on Wednesday. On the other hand, Drutojan Express leaves Dinajpur towards Dhaka at 09:15 AM and reach at 6:10 PM. This is all about train schedule from Dhaka to Dinajpur and Dinajpur to Dhaka. Note that ticket price up and around Dhaka is same as the above list of ticket price. Have a pleasant journey.